My Never-Fail, Favorite Meal. [featuring the always amazing avocado] | Eat More Plants. Without a doubt, this is my idea of perfection. I could eat it everyday and never get sick of it. For aesthetic purposes, I pictured it nice and neatly stuffed together but in real life I just mash up a whole avocado into a half cup of warm quinoa, 1 tablespoon of soy sauce or tamari, half a lemon or line squeezed and a few shakes cayenne pepper. The most important thing about this dish is that you can taste every component. If you can’t taste the soy sauce, the other flavors won’t develop enough. Too much cayenne and everything will be over powered. You can always add more of something so start small! You need to play with the proportions of everything slightly as you make it. I make big pot of quinoa each week and use it as needed all week long, to mix in with lunch or dinner. Same goes for avocados; I usually buy a bunch of unripe ones and use one each day as they get soft enough. Sounds quick and delicious! Thanks so much for sharing! Of course!! Always wanting to share my meals especially when they’re this good. 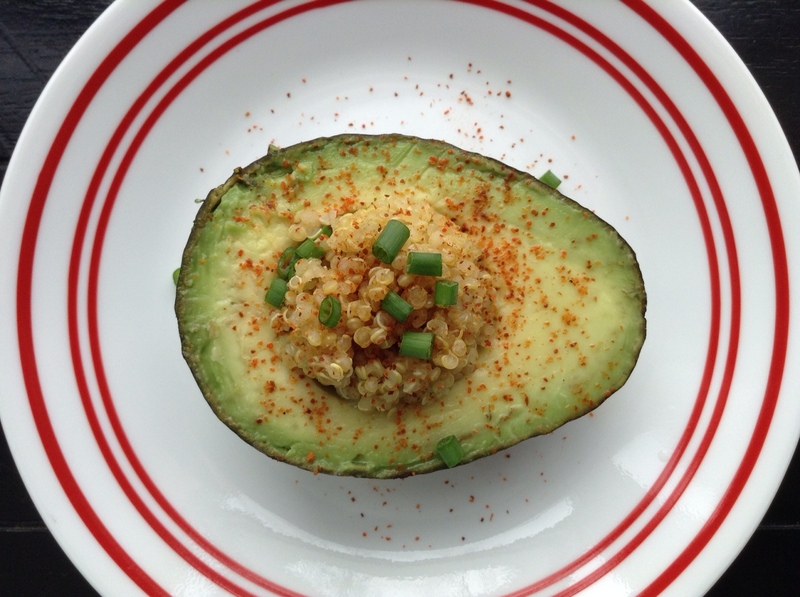 I have a feeling this avocado+quinoa situation and I are going to be friends. Yum!! It’s addictive!! 🙂 hope you enjoy. I eat avocados this way too, sans quinoa! I will have to try it. I keep a batch of either quinoa or brown rice each week myself. I love avocados too. Can’t believe it took me (several, not saying how many) decades to figure this out!! !